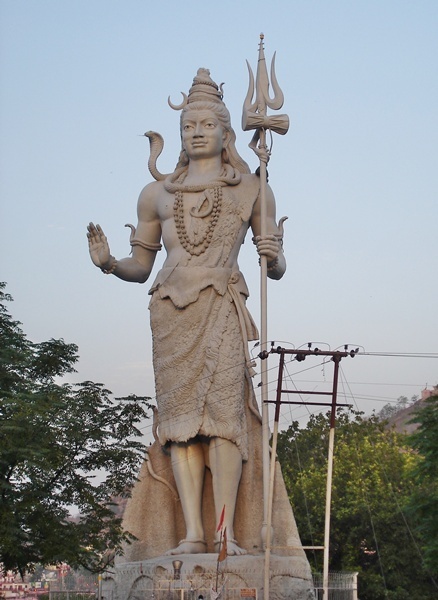 This is the statue of Lord Shiva located in the city of Haridwar in the state of Uttarakhand, India. Haridwar is regarded as one of the seven holiest places to Hindus. Haridwar stands for "Gateway to God" - Hari means god and dwar means gate. And true to its name derivation, Haridwar is indeed a gateway to reach Badrinath, Kedarnath, Gangotri and Yamonutri pilgrimage centers. This staue is situated at the river banks of the River Ganga and along the highway - Haridwar to Dehradun or towards Rishikesh. This statue enthralls hundreds of thousands of pilgrims and tourists from all over the world every year. This photograph of Lord Shiva statue was taken early morning in May 2011 on our way to Badrinath, during which for the period of 6 months my husband was assigned as one of the Medical Officers under the Ministry of Health and Family Welfare, Uttarakhand.